Here’s something different to start your day off. Add the remaining ½ cup of milk, maple syrup, cinnamon and 1 cup of the blueberries, heat and stir until warmed. 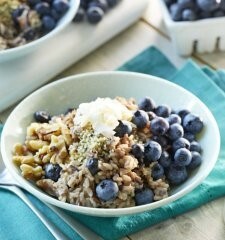 Serve warm topped with the remaining blueberries, flax, hemp hearts, walnuts and coconut.